I'm happy to say that I finally finished my pattern for the Liberated Churn Dash QUILT! It's been tested for accuracy and up for sale right here. I'm giving away one copy of the pattern to one lucky commenter on this post! 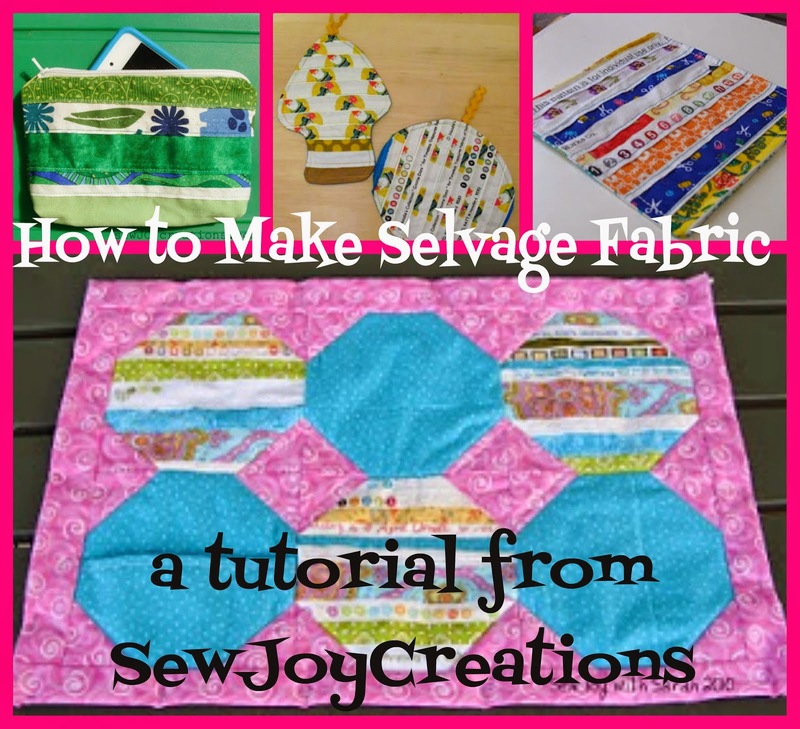 It is a downloadable pattern, so with no shipping, the giveaway is open to all of my readers. you are working on this summer. 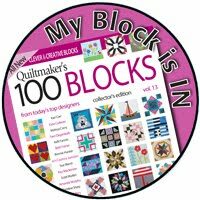 They can be quilt related - or not! You can get a second chance by blogging about the giveaway with a link back to this post and leaving another comment. Do you Facebook? You could link to this post and leave another comment for another chance. Giveaway is now CLOSED! Thanks for entering! I've had my eye on this pattern for ages. It would be great to win it. This summer I'm learning Shashiko embroidery so I can do it in the one a/c room I have. Interesting pattern! I haven't seen something like this before. Love your pattern, I am fairly new to quilting and would love to give this as try. This quilt pattern is AWESOME!!!! I am making tote bags to give as Best of Breed prizes at a rabbit show at CountyFair plus helping my husband do his chainsaw carvings (I paint them). 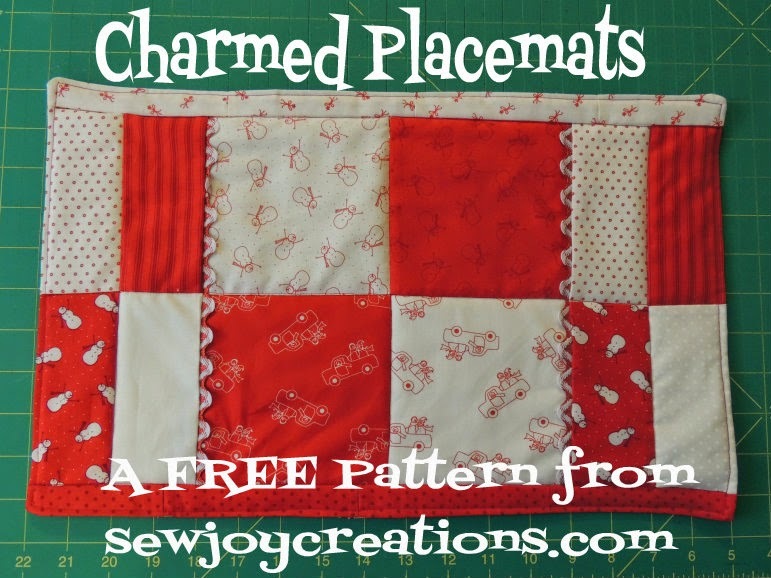 Such a creative and fun pattern! Churn Dash is one of my favorite paterns, and this one is so COOL! wonderful, Sarah! I hope to get some UFO's done this summer....hoping! I was thinking about your Liberated Churn Dash tutorial last night. I'd love to win a copy of the pattern. And how generous of you to leave the original tute up. Whoops--I got distracted by the All Star Game. This is my summer to finish up some WIPs and create some mini quilts. So far, so good. I've been working on a black and white quilt for my husband. Two more borders and it will be ready for the quilter! Woo hoo! Love the secondary design I see in the pattern.. I am working on making wonky blocks after years of straight and even. I started a scrappy star quilt a couple of days ago and have almost all 30 blocks done. I think I have 4 more to do. Then I started a quilt along that is quilting and crocheting. 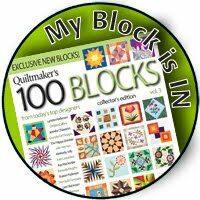 And I joined the group that will be making the tetris quilt. 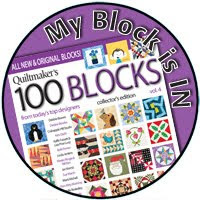 I am also doing the quilt gallery's beginner quilting blocks. Gee, I have a lot of projects going at once. And I am sure that there are more but I can't think of them right now. 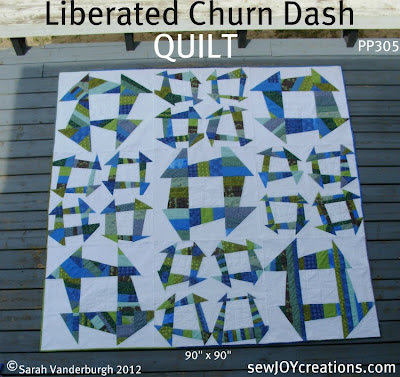 Love your Liberated Churn Dash! Very cool! 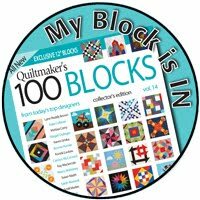 I have several projects that I am working on, Takes Two Quilt, Building Houses quilt, Civil War Diary Quilt just to name a few. Happy quilting! Wow, this quilt is just too fun! 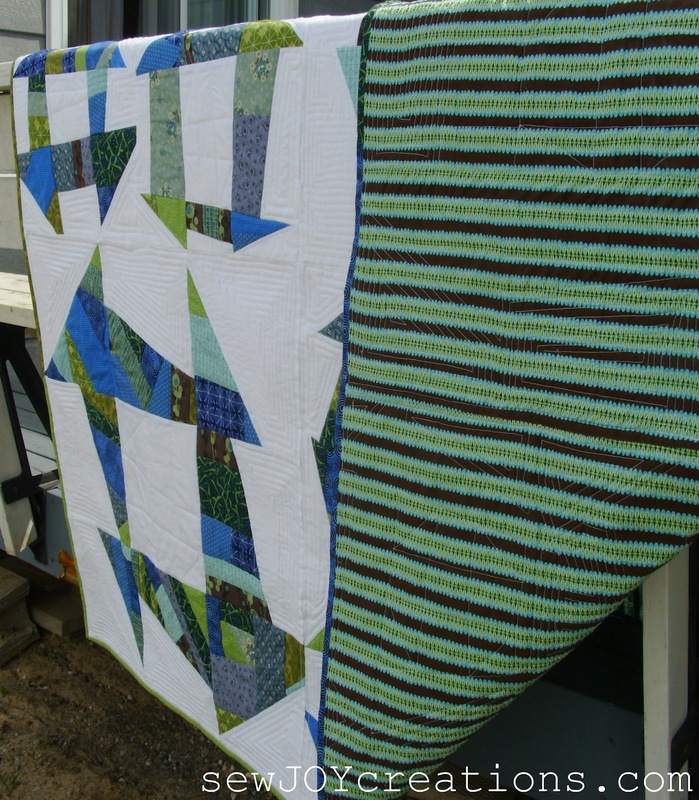 You said this quilt was sewn together in panels so we could quilt it on our home sewing machine. That is exactly what I'd love to do, so I must have your instructions, please and thank you. This summer I am painting my kitchen and having hardwood installed and kitchen flooring replaced, then sewing. I just finished a Red and White Churn Dash quilt, well almost, it just needs the binding but it's certainly not liberated! Love your pattern. I'm working on a queen size quilt for our bed. Thanks for the giveaway. I would love to win your pattern, I have some batiks that would be perfect. Working on a baby quilt for a shower present. Thanks for all your inspiration. Love the churndash pattern! Am presently working on 2 shirts, and a couple of curtains for my house! Wow this is a really pretty quilt. Ill bet your husband loves it. I LOVE that pattern, and the quilt is on my to-do list. I just got finished making a denim & plaid shirt quilt, it's going to Alaska to my brothers house. I am going to start a basic squares patch quilt for a wedding in early Sept.
Oh goodness, I am on project overload for the summer. Love the pattern and quilt you made. What a neat pattern. Great looking quilt! I have several classes and groups each month. I'm working on a civil war quilt, General's Wives, an applique BOM, two embroidery groups, a snowman quilt and tea towels, a hand piecing BOM, another BOM and if that wasn't keeping me busy enough, I signed up for a scrappy log cabin quilt class and another embroidery class doing Gardener's Alphabet. Oh and I have a few dresses and some shorts to sew for charity. I love this pattern! Would love to win...thanks for the chance. While I love liberated quilting, right now I have raw edge applique house blocks ready to hand quilt with perle cotton!! Isn't it just great to be liberated! We do not have to do it by the book anymore! 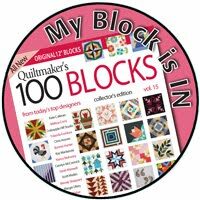 We can be fun quilters and no quilt police! For this summer I have promised to make deacon stoles for a friend who is being ordained in February. 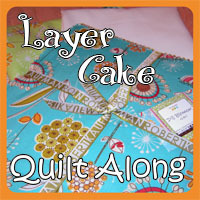 They will be quilt as you go layering. Need one each white, blue, green, red, purple, and pink for the seasons of the church year.